Note: Fill modifications are only possible for users who are authorized within TT User Setup to change account information on fills. When a fill in the Fills Pane or a fully filled order in the Order Pane is confirmed, attempted changes to any of the five fields is prevented. From the Control Panel, click the Window menu and choose Orders and Fills Window. 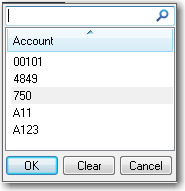 From the Fills pane, click the Account Number, FFT2, or FFT3 field for a fill. If you are restricted to trading in specific accounts in TT User Setup, the Change Account drop drown dialog box appears. Change the account value or select an account value from the list. From the Fills pane, click User Tag or Order Tag to add/modify this information for the fill as needed.